Ten of the most 'outrageous' cases of flytipping in Hertsmere have been revealed as part of a major campaign to raise awareness of the crime as the number of incidents soar. Sofas, fridges, bed mattresses, pots of paint, door frames, antique furniture and even laundry bags of cannabis are among the items found by Hertsmere Borough Council staff dumped on the sides of the borough's roads and other public areas. Now, in a bid to alert people to the terrible blight on the environment and the growing cost to taxpayers, Environmental Health officers have listed their most unsightly and anti-social cases. It follows the launch last month of the council's 'Could this be yours?' campaign highlighting the dangers of using unlicensed waste carriers. Homeowners are at risk of breaching their duty of care as set out in the Environmental Protection Act 1990 if they pass their waste to an unlicensed carrier and it is dumped illegally. "Our job is probably one of the least desirable in the council, as we have to rifle through other people's waste in search of anything, old bills, envelopes, letters, which might help us work out where it comes from. We then work with the police to track down the people responsible and take them to court. Last year, we investigated 230 cases of fly-tipping, which is up 150 per cent from five years ago. It's probably not a well-known fact, but if your rubbish is found to be dumped illegally, then you could be charged and fined thousands of pounds. Don't take the risk, just ask to see a licence and ask for a receipt." Hertsmere Borough Council say since 2010, the number of incidents of fly tipping has almost doubled in the borough, from 368 in 2010-11 to 658 in 2015-16. The cost to taxpayers of investigating and removing the waste has also rocketed to more than £125,000 over the last five years - the equivalent to creating two play areas or employing four and a half PCSOs for one year. "We just cannot reiterate enough how burdensome fly tipping is to the local community. It's not just unpleasant to see, it's a terrible waste of time and money. You can do your bit to prevent it happening in the first place by making sure that any waste carriers you use are licensed and asking for a receipt for anything they take away. The last thing anyone wants is to answer a knock on their front door to be confronted by an Environmental Health officer with pictures of their unwanted household items strewn across a road or field." 10. Documents found in a large pile of mixed builders' waste in September 2012 led council officers to a property being renovated in Bushey Mill Lane. 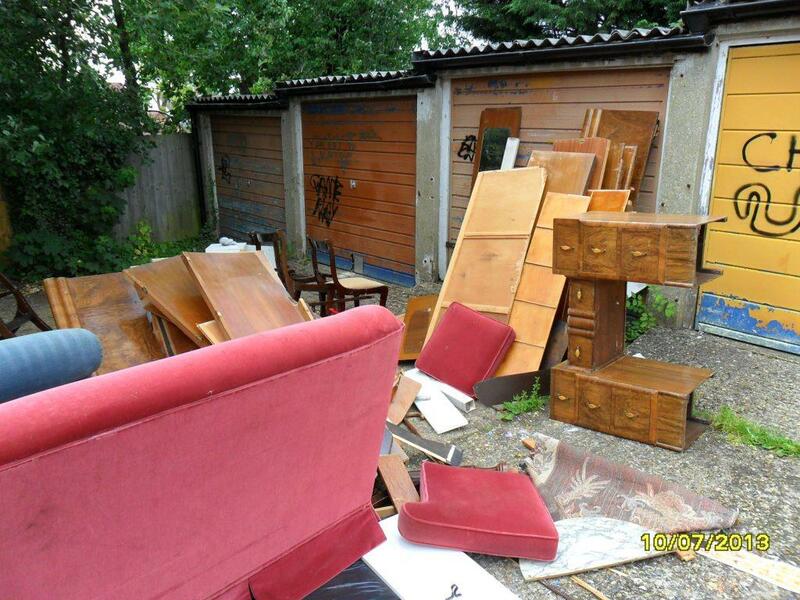 A 22 year old from Bushey was found guilty of the unlicensed dumping of controlled waste and fined more than £1,000. He had dumped the waste behind his home. 9. A local builder arranged to have mixed waste removed from a property for £100. Five days later, the waste was found in Otterspool Lane, Bushey, where it blocked the road. Environmental Health officers traced the waste to a 22 year old Sandy Lane resident. He claimed he had passed it on to two strangers that he met in a pub in Watford. He was fined nearly £9,000. 8. 33 pages of a mobile phone bill and receipts with a registration number were found among a huge amount of waste dumped in a field in Borehamwood. They led officers to a former Green Street resident. His tipper truck had been seen entering the field with a full load and leaving empty shortly after. The 32 year old claimed to have sold his truck earlier that day to two men for cash and no receipt. He was found guilty of four charges of failing in his duty of care and fined more than £1000. 7. Waste found on a farmer's field off Silver Hill in Shenley in August 2011 led to one man being fined more than £2000. When officers searched through the waste, they found a document with an address in Newark Green. Officers visited the house, where the builder provided contact details for a Sandy Lane Caravan Park resident. He claimed he had passed the job to remove the waste to a person from the Three Cherry Trees Caravan Site in Hatfield, but that person was never traced. 6. In October 2013, a builder arranged to have mixed waste removed from a site in Queens Road, Watford. Six days later the waste was found in Hilfield Lane, Aldenham, where it blocked the road. A document led the investigation to the Queens Road site and the assailant was traced through a mobile phone number he gave to the builder. He was fined nearly £500. 5. Environmental Health officers were making a routine visit to Hilfield Lane South in Bushey, when they found three large laundry bags stuffed full of herbal cannabis. The bags were handed to the police and an investigation is ongoing. 4. In June 2013, a father and son from Harrow removed waste from a house in Ruislip that had undergone building work. The waste was found two days later in Hilfield Lane South, Bushey. Documents in the waste led officers to the pair, who denied involvement. Four months later, more waste was discovered at the same spot. It was traced to a carpet shop in Harrow where CCTV showed a vehicle owned by the son taking away the load. The pair were eventually fined nearly £1500 each. 3. Two men were discovered carrying a wardrobe from a van to a pile of rubbish by Metropolitan Police officers on a cross-border operation to combat vehicle crime. More rubbish was found in the back of the van, along with a third man. All three were illegal immigrants - two had been in the country for approximately three years and the third arrived only two days previously having paid £1,000 to be smuggled in. They were cautioned and removed by immigration officials to a detention centre prior to deportation. 2. Council staff spent weeks clearing service roads in Borehamwood including between Whitehouse Avenue and Cardinal Avenue, and along Shenley Road. Council leader, Councillor Morris Bright, who commissioned the inspection of the roads following complaints from residents, said: "Although these are areas of private land, the council is very concerned by the squalid state of these service roads and the potential health hazard."